A Tale Of Two Cities: Mixing The Urban Poor Into A Rich Urban Life Instead of razing slums and shunting the poor from sight, inclusive cities build bridges — or in one case, an escalator — from poverty to economic opportunity. 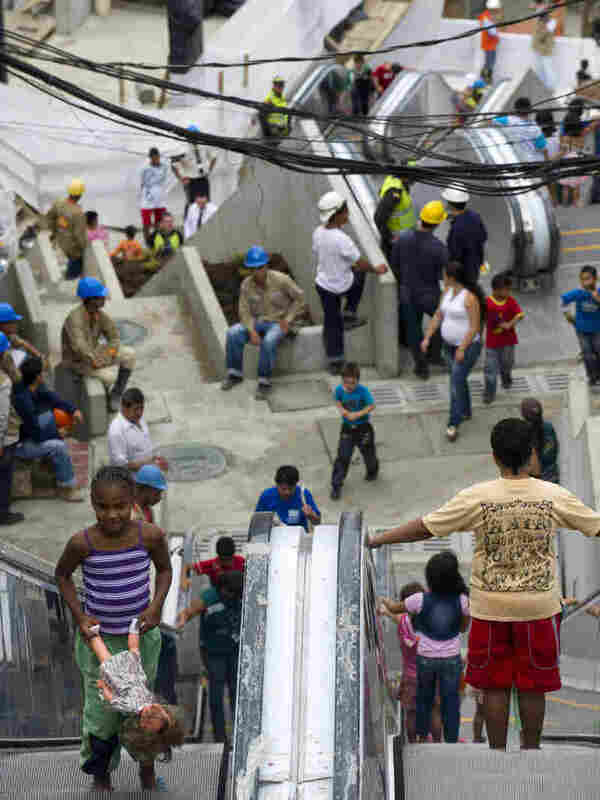 The escalators in Medellin, Colombia, on Dec. 26, 2011, the day of their inauguration. Skyscrapers and shanties, gleaming malls and rundown markets, palatial houses and the piss-poor guys who build them: Those are the divides in cities like Mumbai, Nairobi and Manila. Rich and poor do not much mingle. But a movement is afoot to change that. It aims to integrate the poor into the urban bloodstream, instead of shunting them from sight. For this "inclusive cities" movement, urban renewal doesn't require razing slums and markets. Instead, these world-class cities embrace their informal workers, those who work for cash and usually lie outside the tax system, uncounted. 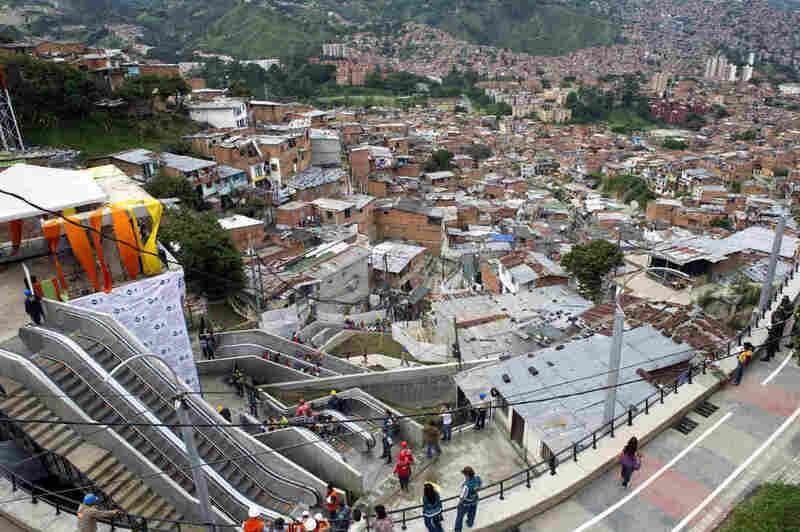 The 1,300-foot escalator linking hillside shanties with the city's commercial center is a living metaphor, linking the poor to economic opportunity. The inclusive-cities movement is small but gathering momentum, even as people within it debate what inclusiveness really means. This year's gathering of the U.N.'s World Urban Forum focused on equity in the developing world, while the Fletcher School of Diplomacy's annual inclusiveness forum focused on cities. Grass-roots groups and networks have long championed the plight of the informal worker, but recently a glossier benefactor stepped in: Finance behemoth MasterCard last year launched a think tank called the Center for Inclusive Growth. "The success or failure of the human species will be determined in cities," says Yuwa Hedrick-Wong of the MasterCard center. Rapid urbanization over the past 50 years — with more to come — as well as a sense of growing inequality are to credit for the focus on inclusive cities. As of 2010, the majority of humankind lives in cities rather than in rural areas. "Humanity is now an urban species," says Hedrick-Wong. The proportion of city dwellers is rising. It's expected to reach 70 percent by 2050, and most of that urban growth will happen in the developing world. Which is one reason inequality is on such vivid display in the cities. Just for stability's sake, politics needs to respond to informal workers, observers say: The threat of protests and demonstrations challenging political authority is greater in cities than in the countryside. "The economic growth in cities is rarely inclusive," says Oren Ahoobim of Dalberg Global Development Advisors, a consultancy. "With the resulting inequality, you'll get more people showing up on the streets to advocate for policies that let them tap into that growth — and that's part of what's driving this thinking." For WIEGO and other grass-roots groups, inclusion means things like recognizing informal workers, protecting them from displacement and extortion and providing health and pension benefits. For the World Bank and others, inclusion often means getting informal workers to pay taxes, access loans and participate in the formal consumption market, says Roever. For Hedrick-Wong, though, it's not either-or. "Actually, it's good for business, too. When growth is not broadly shared, it tends not to be sustainable," he says. Although inclusiveness is a growing political concern for leaders, it's not without risks, as the case of Bogotá Mayor Gustavo Petro suggests. In 2012, the controversial leftist moved to incorporate the city's informal trash pickers into the official economy, which would reduce its reliance on private collectors. The handoff was bungled. For three days, mountains of garbage piled up on the city streets. In December 2013, the country's inspector general removed Petro from office and banished him from politics for 15 years, alleging that he violated the principles of free competition and threatened public health. Uproar ensued. The Inter-American Commission on Human Rights protested. The man was eventually reinstated, and for the moment, Bogotá's waste-pickers are still on the municipal job.